Mercury vaporises are room temperature. So yes, people would be in danger. Re: "Is there really a risk here? Well, no. The EPA has found that "nearly all methylmercury exposures in the U.S. occur through eating fish and shellfish." Silver tooth fillings contribute only a neglible amount." Quantities of mercury are measurable in totally different forms of mercury, with different sources and also different reference ranges. The main type of mercury emission being measured from the fillings is the mercury vapor form, not the methylmercury form. Therefore the EPA comment about methylmercury is not a correct comparison and simply does not entail your conclusion that there is therefore no risk. In saying so, you commit two of the common errors of fallacy: hasty generalization (the fallacy of inferring from some to all) and ad ignorantium (the fallacy of supposing lack of proof proves something). This is also an example of the syndrome you cite in your opening: the statement is either made in ignorance or fraudulently, but either way, is misleadingly false. Good point - I edited the post to clarify this distinction. Still, my main points about Oz remain valid. Your primary reference for your primary claim is "A thorough scientific review in 2004". I see that this review was only "thorough" for studies published between 1996 and 2003. As you rightly said yourself, "I found studies going back to the 1970s..." Ah........ yes. Therein lies the rub. A great deal of research has indeed been published on this subject, over a long period, but when the International Academy of Oral Medicine and Toxicology (IAOMT) began funding independent research of a higher quality, especially in the 1980s and early 1990s, the findings were overwhelmingly concerning. So much so, that a number of governments around the world legislated against the use of mercury dental fillings at that time - leading to the complete withdrawal of their use - such as, for example, Switzerland, Norway and Sweden. Are you therefore saying that the governments of countries such as these acted based only on speculative pseudoscience? In fact, the explanation is simple: they did more research than you have done, a statement I make based on the poor treatment of this subject in your article above, which shows a poor knowledge base. A second fruitful period of research was the last decade - i.e., SINCE 2003 - which has led to the UN Environment Programme issuing a recommendation to phase out all uses of mercury INCLUDING dental fillings because of environmental hazard - another major aspect of the topic you do not even refer to in your article. How convenient, then, that the only reference you give limits itself to a small number of years within your definition of "thorough", 1996-2003, which also happens to exclude two of the most fruitful periods of research on this topic. And, I say this even assuming (which is a very big assumption, that may prove incorrect) that the review you cite was well done. For better, more comprehensive science on this subject, and quality references and articles, I would suggest instead that any reader see http://www.iaomt.com/category/articles. Actually, for a more comprehensive debunking, see Stephen Barrett's lengthy discussion, http://www.quackwatch.org/01QuackeryRelatedTopics/mercury.html or the entire site he created for dental quackery, http://dentalwatch.org/. More comprehensive ? Really ? Your response indicates you did not bother reading anything at the link "commenter "biggies" gave you. As a "scientist" it should concern you that they were huge errors in the FDA's amalgam rule. Luckily the IAOMT and other scientists pointed out the FDA mistakes in their "petition for reconsideration". This petition prompted FDA to take another look at the amalgam issue in 2010. FDA (and HHS) is sitting on the amalgam rule, so IAOMT has sent in an addendum to the FDA on the new science that has been published in the last 2 years. You can read about it here or watch a video with IAOMT attorney discussing it. BIGGIES, that was known as the LSRO scandal. That is where FDA circumvented the competitive bidding laws so they could get LSRO to do the review. Here is a video of lawyer who uncovered this through FOIA documents. -- Issue #1: Did NIDCR officials Lawrence Tabak, Norman Braveman, and Marion Blevins attempt to circumvent the competitive bidding laws? -- Issue #2: Did Tabak, Braveman, and Blevins generally engage in activities designed to cover up their violations by creating a façade of legality? -- Issue #3: Did Tabak, Braveman, and FDA’s Runner put together an “outcome biased” study? -- Issue #4: Did Director Tabak provide false or deceptive testimony to Congress about the LSRO/BETAH deal? -- Issue #5: Did NIDCR take over what was really an FDA project? -- Issue #6: Did Braveman – along with Runner, “subcontractor” LSRO, and “contractor” BETAH – shut interested citizens and consumer groups out of the process, despite assurances to the contrary? -- Issue #7: Did BETAH willingly accept its role as the strawperson contractor, in light of its lack of expertise to do scientific studies, or was it pressured into going along with the scheme out of fear of losing other NIH business? -- Issue #8: Did the participants misrepresent the contract as a “conference” instead of a “study”? -- Issue #9: Did LSRO secretly negotiate a contract, even though it was neither an existing contractor, nor a sole source supplier, nor the winner of a competitive bid? -- Issue #10: Did LSRO conduct an “independent” scientific inquiry? for more information on this scandal, go to the link above. Posted at Forbes, but thought it should be here as well. Steve, you do yourself and your “skeptic” readers a disservice by offering so many flagrant inaccuracies. How odd that you seem unaware that mercury vapor as released from amalgam fillings is extremely toxic (10x more toxic than methylmercury if using the EPA’s RfC’s for comparison). Of course as a “scientist” Salsberg knows being exposed to mercury vapor doesn’t immediately kill someone, he uses that benchmark out of ignorance or to intentionally mislead people as anyone who has browsed the scientific literature knows exposure to mercury vapor induces a multitude of symptoms depending upon the person, not immediate death as you like to infer. Through-out this article, Steve is not one for details when it get’s in the way of his misleading statements. Had he bothered to look he would have found that mercury spills (as from a thermometer or other sources) are a very big deal at least to the EPA and ATSDR (Video of PSA from EPA / ATSDR below). I had to laugh at your statement that there was no recent evidence to suggest mercury fillings are unsafe. One would expect that you would at least do a search of the scientific literature before writing such an bold (inaccurate) statement. List of a few recent studies are at the bottom of message. Additionally you incorrectly tried to link methylmercury as the main source of mercury from dental amalgams. This oversight is so outrageous that I find it humorous that you would write it. As you like to try and frame things… "either he is ignorant, or a fraud !" - this study found that using the 20 year old EPA RfC, over 60 million Americans receive more than what is considered “safe” from their mercury fillings. If a more up to date RfC was used (such as CAL-EPA) then all 120+ million American with amalgam would be over the daily “safe” limit. Once again, for those who’ve read Steve’s article, that is MERCURY VAPOR, not methylmercury. Recent published studies (discussed below) revisiting the CAT data have largely rebutted and disproven the conclusions of the CAT parent studies, demonstrating that adverse effects in these children are identifiable and dose-dependent. Moreover, authors of these parent studies have recently published an additional study demonstrating that the subjects of those studies demonstrated neurobehavioral harm as a result of the placement of mercury fillings. BTW: By sending the previous commenter to quackwatch, that tells me you are not one for intellectual curiosity when it comes to learning about something which you think you know something about. Elemental mercury 10x as toxic as methylmercury? I'm afraid that you have those reversed there. Methylmercury is substantially more toxic than is elemental mercury. Perhaps " the EPA’s RfC’s" aren't as good indicators of the toxicity of materials as, well... the toxicology of those materials. I see, so instead of relying upon EPA's established RfC's for a reference I should rely on your opinion that methylmercury is more toxic. While I easily concede that they are both extremely toxic and all efforts should be made to limit our exposure to either form of mercury,the fact remains that according to EPA's numbers, mercury vapor has a safety level that is 10x times lower than that of methylmercury. Steven. You quote Stephen Barrett - a quack, not a quack-buster - as an authourity on this subject??? and expect that to be an acceptable response to a scientific rebuttal, shame on you. You represent the worst of our society when you use your qualifications and your responsibility as a reporter to educate the general public - and you are not even capable of educating yourself first. Again shame on you. Next time learn before you open your mouth as you do a grave disservice to this subject, your fans and to your profession. Steve, are you sure you want to be associated with Barrett or any of his writings ? "...the only other explanation I can think of is that he is simply a fraud. I don't think that's true, so let's give him the benefit of the doubt and assume that when he makes a mistake, he is simply ignorant of the truth. How can anyone with his education be so blatantly ignorant? If this is what Harvard produces these days, remind me to send my kids elsewhere. Are you just being gracious to "give him the benefit of the doubt"? Professional courtesy? Well, I have no such quibbles--HE'S A FRAUD. I wouldn't let him touch my heart--or anything else. Ah Janet, it's ashame you offer no specifics and you skip past the "trolls" who've actually looked at the science and have offered concrete examples of flat out mistakes in Steve's article. Apparently he is either too proud or a fraud himself (as he likes to paint others) to recognize and change those mistakes. 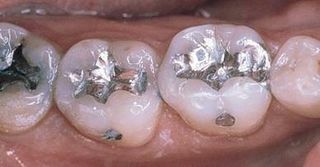 A one gram silver amalgam filling as it is called contains 50% mercury. Therefore there will be one half of a gram of mercury in the filling this will disburse creating 10 to the power of 20 mercury ions. Anyone one of which can bind to a tublin molecule and create disfunctional microtubules and gene expression. Because of lead toxicity the government has banned use of tetraethyl-lead in gasoline but for the last 30 years has refused to ban mercury amalgam which is the most neurotoxic substance on the planet.Yes I think everyone should be worried even the dentists. Until I know your qualifications for "looking at at the science", I have no reason to think your views are anything but those of a crank, since they are in opposition to accepted science. Dr. Salzberg offers evidence and has a paper trail of his reputation, so I'll stick with him, thanks. To promote the safety of this toxic product Dr Salzberg incorrectly identifies methylmercury as the primary form of mercury that is released from amalgam restorations. It is not even a question that the primary form of mercury escaping from amalgams is mercury vapor, because amalgams are made from elemental mercury, which releases...you guessed it...mercury vapor. (WHO 1991 and 2003, among many others). Salzberg can't even get the most basic aspects of this issue correct when trying to imply the product is safe. As far as the toxicity of methylmercury VS that of mercury vapor. The EPA has a safety level for mercury vapor that is 10 times lower than that of methylmercury... meaning it is considered more toxic than methylmercury. Additionally, EPA / ATSDR evacuates people from buildings when there is a mercury spill as small as what one might get from a thermometer. You can search youtube to see tv news broadcasts of this or search EPA / ATSDR for their action level and relocation level of mercury vapor. those are Salzbergs most glaring mistakes, which makes him the CRANK as he did not perform due diligence when writing about this subject. my dad tells a story of when he was 5 years old they would hold mercury in their palm and played with it (didn't know any better at the time). that was 60+ years ago. that doesn't mean it's safe but suggests evacuating the room comment is ridiculous! disclaimer: i know nothing about mercury or its various forms. organic, nonorganic, vapor, might be quite different. You're more likely to die in a car accident than supposed risks from mercury fillings. Worry about something that actually kills - texting, eating, reading, radio blaring etc while driving rather than pseudo scientific warnings that have no logic. You're more likely to die on the roads going to a pseudo science conference than from the mercury in your fillings. Life is a risk, so the best thing you can do is to understand where the real risks are and try to ameliorate those with real strategies that will reduce risk.